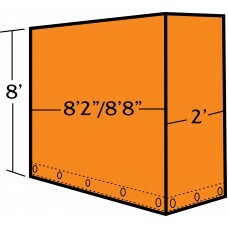 We stock a 8’8”W X 8’H X 2’L for a 102”W trailer in 18 OZ Black Vinyl with grommets on the hem. Custom sizes and colors available. Go to Request Quote and Submit your information along with the type of trailer, Width & Length of Trailer and let us know what you carry, also let us know how many rows of D-Rings you want on the drops & Flap.